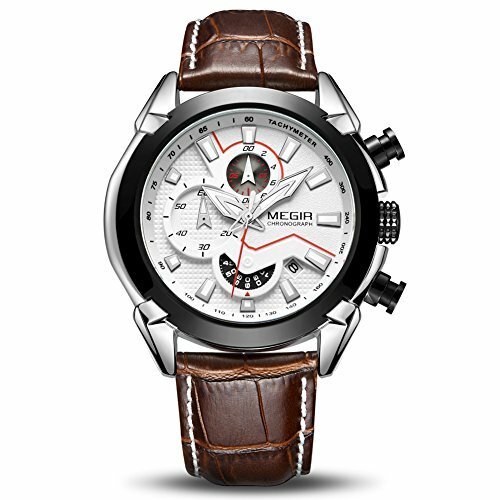 Megir are your typical Chinese watch maker who has a few different brands and sells their watches mostly online. At least to the Western world. They used to focus more heavily on the Chinese market, and have apparently also dabbled in higher end watches for the Japanese. 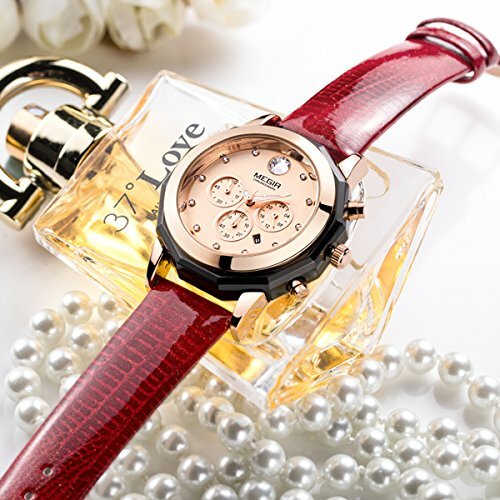 But for us, they typically sell super-affordable and modern looking watches on places like ebay and Amazon. You get what you pay for with a watch like this, that is for sure. But that is not to mean it is not for you. If you only want to spend 30 bucks on a watch that looks like it cost hundreds, then it’s a great option. They use accurate quartz movements, that last for years. They come with loads of features – like a date and a chronograph (which seem to be on every model, a rarity for most brands). And there are a huge variety of styles and colors to choose from – from sports, to dress, and everything in between. 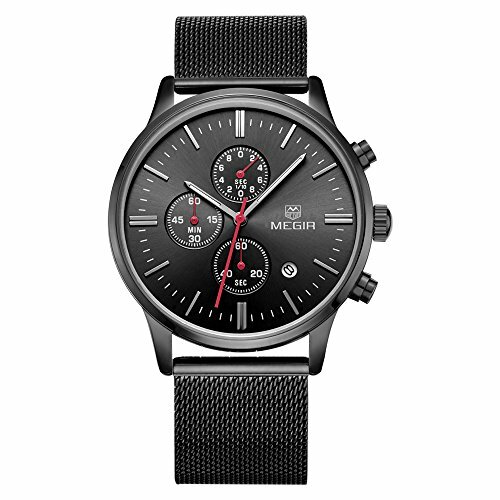 So, if you want to own a super affordable watch, or even a few, so you can choose which to wear with what – then Megir is a good option. 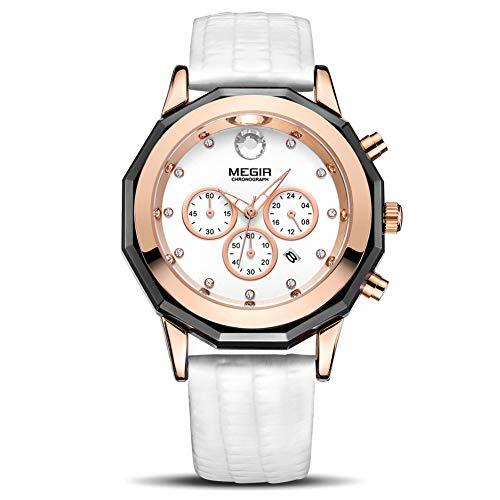 Let’s start with one of Megir’s most popular models – a clean, white dial chronograph with dress-worthy stitched leather strap. It’s no surprise that this is so highly rated on Amazon (4.5). It’s clean design, with modern touches like the cross-hatching on the lower half of the dial and the black sub-dials with bright blue hands. The hexagonal case with screws on all corners is reminiscent of the Hublot design, which none of us can afford. Overall, it’s a solid performer for the cost of less than 50 bucks, but don’t expect a Rolex. The build quality according to reviewers is decent, but some people do notice some shortcomings like misaligned sub-dials. However, it’s so affordable, I am sure anyone looking at this price point won’t mind! If you want to go for something more in the direction of a racing watch, somewhat like the TAG Heuer Monaco, then this square-cased, all stainless steel chronograph certainly stands out. It works well as a dress or work watch, with the clean white dial and all steel look. The jubilee style bracelet with two-tone steel elements matches the overall aesthetic to a tee. The dial might be a little too “busy” for some, with the 3 sub-dials and the long date window on the right hand side, but for me it is just another unique element of the watch. The only elements that don’t work in my opinion are the chrono pushers. They look a little oversized and cheap compared to the rest of the watch. 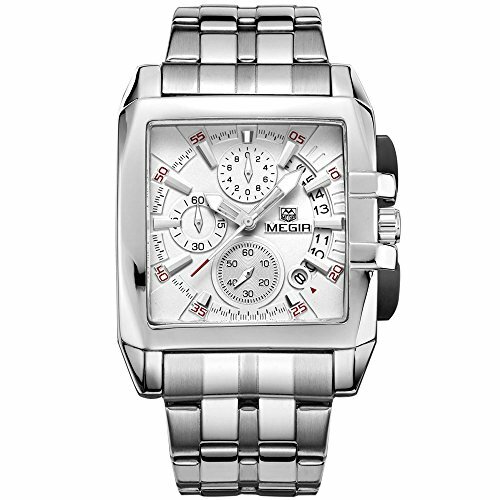 All in all though, it is a great looking watch with affordable specs – quartz, steel, mineral glass etc. 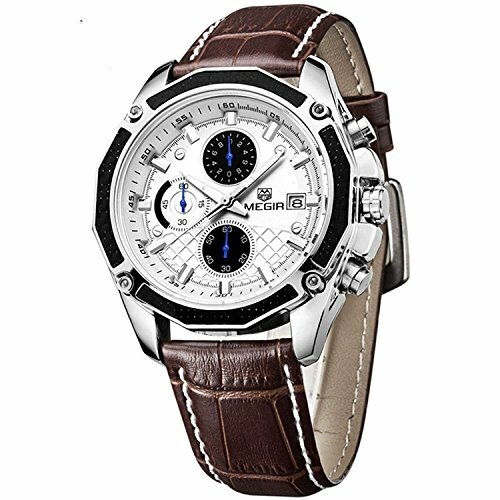 Megir seems to like chronographs on their watches, so this is yet another one in their range that is very popular and rates well on Amazon. This model is more focused on sports, mimicing the dive look with a dark plastic bezel on the outside, which as far as I can tell, does not actually move. That’s fine though, because at 30m water resistance, you won’t be doing anything but washing the dishes with this watch. It’s not for swimming. The overall look though is sporty indeed, with the dark blue dial with del accents on the sub-dials and second hand. This is repeated on the silicon strap, which completes the style of the watch. If you want a little mix of a classic stitched leather strap, with a modern and bright color scheme, then this is the watch for you. Megir has gone all bright with the stunning screwed case and dial on this model. The use of orange for the odd Arabic hour markers and stitching on the strap works very well. As do the anodised blue pushers and crown. It’s also the little touches like the upper and lower sub-dials in sliver, while the 9 o’clock one blends in more in a darker blue. 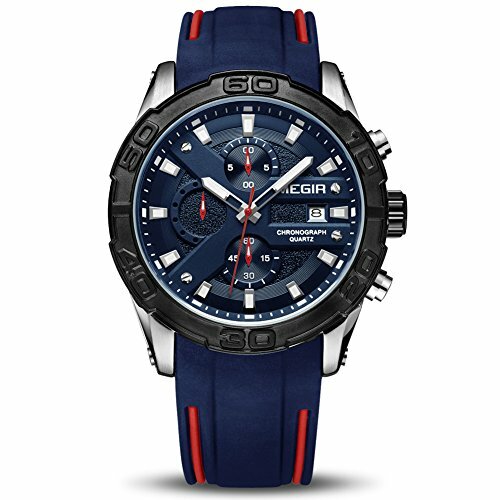 Again, this is not a watch you are taking diving or swimming, but is a stand-out, modern, affordable model that you can wear to work, out on the town or even as a daily beater. If you want a little bling, kinda like the Rolex Day Date, then this gold (actually it’s steel, colored as gold – this is a super affordable watch after all) and blue model will certainly get people’s attention. The bracelet and case are all sparkle with their gold tint, and white the inner bezel and dial are dark blue. Overall, it gives this watch a modern touch, while still looking super-expensive. 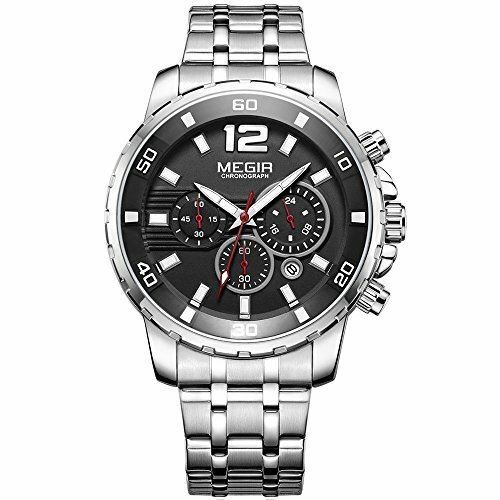 There is, as always with Megir, a date window and chronograph, so you also get a lot of functions for your buck. But it’s only 30m water resistant and uses a standard quartz movement, which will likely always stay accurate, as quartz is known to do! Note: If gold ain’t your thang, then there is also a silver and black model show below it. Just click on the image to get to the product page. Megir has taken another leaf out of Rolex’s book here with a homage to the submariner, maybe crossed with the Daytona. But the green theme on the dial and bezel is very much in line with the “infamous” Rolex Submariner “Hulk” model. This is a very clean and classic Submariner style dive watch with all the trappings: dive bezel, luminous hands, shock proof, protected crown. But at 30m water resistance, you won’t really want to take it diving (or swimming). And as I said above, crossed with a chronograph (what is it with Megir and chronographs? every watch has one!). The internals are of course standard Megir, with a quartz movement, but notably a Seiko hardlex crystal, which is a nice touch. 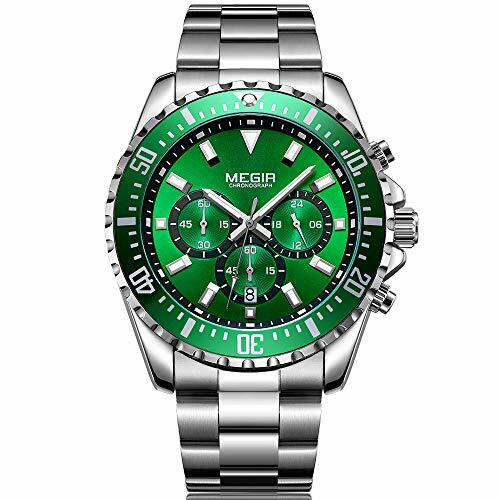 Yes, I am giving Megir watches all their own names, because they don’t seem to do it themselves. 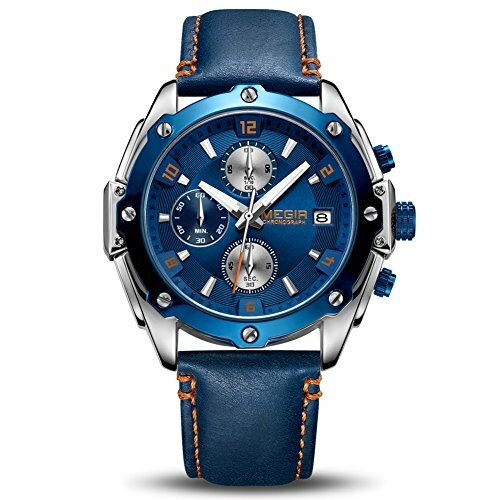 This one is again a chronograph, but it’s a little more modernised and features a classic dress leather strap. It’s quite a large watch at 48mm wide, and the large pushers and dial certainly highlight that fact. The overall black bezel, pushers and crown, with the white and red face, is certainly ultra-modern. There is a second tier to the dial as well, with a guilloche style hashing on the left and bottom. You certainly won’t be wearing the same watch as the guy next to you with this one, it’s unique through and through. Another Hublot inspired watch, this is a rarity on Amazon, a Megir model for women! Ok, there are a few, but not that many. This one features, yes you guessed it, a chronograph, but also a super-clean white dial with crystals as hour markers, which is a nice touch. The bezel is a thick gold to match the lugs and sub-dial rims. And there is a hexagonal black case, to give it that modern Hublot look. It also comes with a red strap and rose-gold dial, for those wanting something a little different. The specs are the usual suspects: quartz, hardlex glass, 30m water resistance etc.